I’ve had a chicken-scratch drawing in my notebook for 2 years and it finally turned into this quilt…Button Up! I used a few prints from the Robert Kaufman line Botanics with some coordinating solids, and a couple of Kaffe Fassett polka dots mixed in. Kathy did the quilting (my shoulders thank her!) and the back and binding are both Botanics prints (all from Pink Chalk Fabrics). Taking photos of quilts with 3 little photo-bombers in the house is nearly impossible! This pattern is available in my pattern shop via PDF or Paper . Thank you for all the football quilt love! I’ll admit I was worried to show you guys that one since it’s a little out of my box…so I’m relieved you like it as much as I do! This quilt is so awesome! A small one would look great hanging on my sewing room wall. You are a genius, really! Such cute pattern, it makes me want to sew it immediately. Bright colors and sumple lines are the best. Fab quilt. Lovely pic of the photo bomber too! Pink Chalk rocks and so does your cool football quilt! Well, I have to say it….it's as cute as a button! This quilt/pattern is just adorable!! Will certainly be adding it to my wish list! You make the best quilts!! I subscribed to the magazine you were featured in just to get that issue. My first issue was 2 issues past that! I called and it was too late to get the back one. I may have to order off Amazon but just wondered if you will be releasing the pattern in your shop at any point? I guess it would help if i told you which quilt, the Winter Snowball quilt ( : Thanks! This is adorable! I love the colors too. Adding thus one to my list of " to makes "
Too cute for words! I love it! Love it! You should totally make this into a mini quilt pattern too!!! Adorable!! And I agree, it would be too cute as a mini. Love, love, love. I'm making this quilt. Wicked cute fabrics and the pattern just shows them off to distinction. Well done !~! Love this! Would make a.perfect valance for the sewing room! I'm enjoying the graphic nature of this design and how you scattered the fun, bright colors. Beautiful photographs! Wow, your house has so much lovely light! 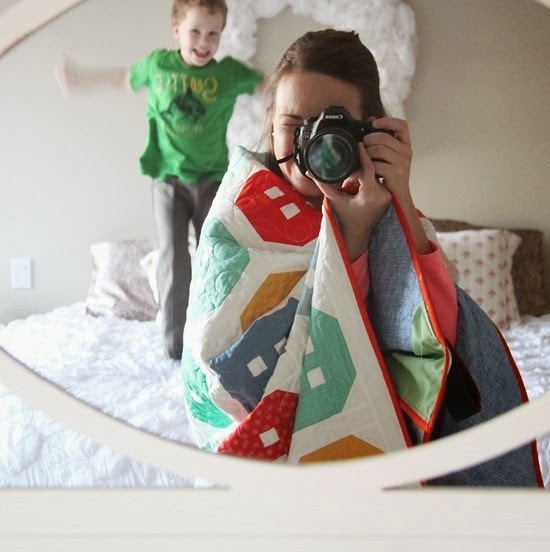 Love the quilt & the photos – especially the photo bomber! funny….thanks for the compliments on the quilting – my shoulders are BUFF!!! You're amazing! You seem to be able to design patterns AND sew up samples so quickly!! I am in button love! This is so very cute. WOOT! Another great pattern. :) Your patterns are so easy to read and the little tips are just GREAT. This is such a happy pattern — so many different effects you could get with different color selections! I love it! Nice and original design!! Very Fun too! This is absolutely stunning, I love it, so bright and cheerful. Can't go wrong with buttons! Too cute! I have a thing for buttons anyway and I just love this quilt! I agree with some of the others, it would be super cute as a mini! Una vànova molt bonica i divertida. That's adorable and looks like a fun make. Absolutely LOVE this quilt!!! It has that certain something about it. Thanks so much for sharing it with us. Oh and the photo bomber is a little cutie. I love buttons and the beautiful colors!